During my last visit to the Beekse Bergen, The Netherlands, I finally had the opportunity to survey this beautiful animal. Normally they hide away behind the trees, but now with lots of pups, they were right in front of me. And yes you guess right, they immediately stole my heart. Knowing me, I started to do some research on it and below are the results. Some people may have come across the dhole, featured as the 'red peril' in 'The Jungle Book' by Rudyard Kipling. This rather unsympathetic portrayal reflects the history of prejudice that the dhole and many other wild canids have suffered. Only with a better understanding can we fully value these unique dogs and their integral role in the forest ecosystem. Within the canid family the dhole is something of a stranger. It doesn't fit neatly into any of the sub-families (i.e. the foxes or wolf-like dogs) and is classified in a genus of its own - Cuon. Among its unusual features is a strange whistle call which it uses to re-assemble the pack when animals become separated in dense forest.� The dhole also has more teeths than most other dogs and has a shorter jaw with one less molar on each side of its lower jaw. The dhole is a highly social and co-operative animal, living in organised packs of around 10 individuals. Groups often contain more males than females, with usually just one breeding female (the alpha female). 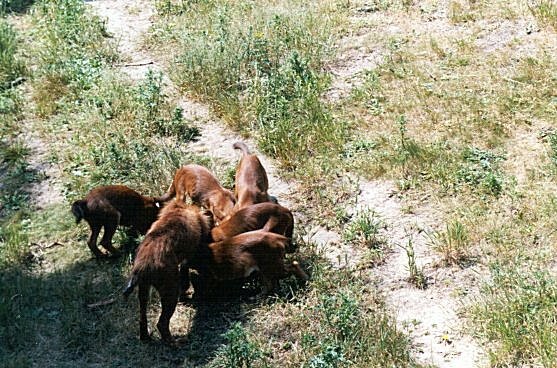 Occasionally, large groups of over 40 dogs have been seen, possibly arising from the temporary fusion of neighbouring packs. Together with the grey wolf, African hunting dog and Amazonian bush dog, the dhole is one of the few dogs that regularly hunts in packs. This requires intelligence, co-ordination, and sometimes courage! In India, one of the dhole'sfavourite prey is the medium-sized Axis deer. On occasions, however, it will tackle even larger prey like the banteng (a large bovid), and highly aggressive prey like the wild boar. With such dangerous quarry, the dogs can literally risk their lives to secure the food they need to survive. Communal hunting isparticularly important during the breeding season when pack members return to the den to regurgitate food for the mother and pups. 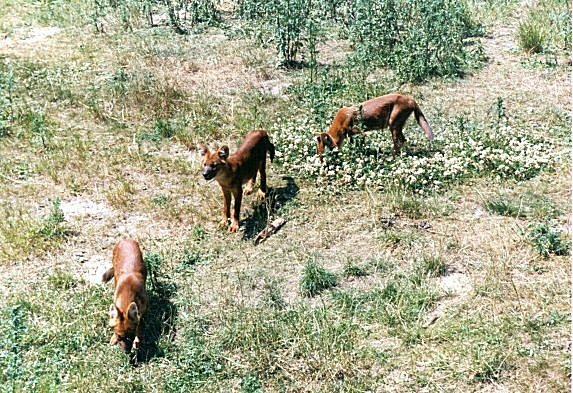 Sometimes, however, dholes prefer to hunt individually or in pairs, focusing on smaller prey such as hares. The dhole normally lives in forest habitats, but can also seeke out an existence in the open steppes of Kashmir and Siberia. 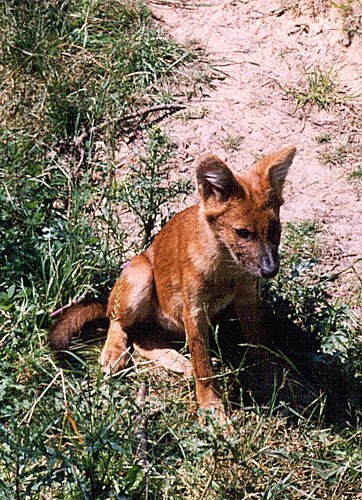 As the Latin name, Cuon alpinus suggests, the dhole is often found in hilly or mountainous regions. The dhole's historical range reflects this great adaptability, extending from India to Russia, and down through China to Malaysia and Indonesia (Java being the southern limit). In recent decades, however, there has been massive habitat loss within this region. Today, very little is known about the dhole's distribution, but restricted surveys indicate serious decline andfragmentation of the former range. The best remaining populationsare probably to be found in central and southern India, but even their stability is in question. The urgent need for more information on the dhole's present distribution has been highlighted in the latest IUCNAction Plan for Canids. The dhole has some extraordinary vocal calls - it can whistle, scream, mew, and even cluck like a chicken. It's been a distinct species for several million years. Sometimes it forms temporary packs of over 40 animals. It breeds communally with most pack members helping to feed or guard the pups. When hunting as a pack it can subdue prey over 10 times its own body weight, and can even fend off a tiger! It exploits a variety of habitats from tropical rain forest and dry-deciduous jungle, to cold alpine forest and open plains. It has amazing jumping powers and can reach a vertical height of at least 2.3 metres (7.5 ft). Its dental formula is unique among the dog family. It is a capable swimmer and often drives its prey into water.